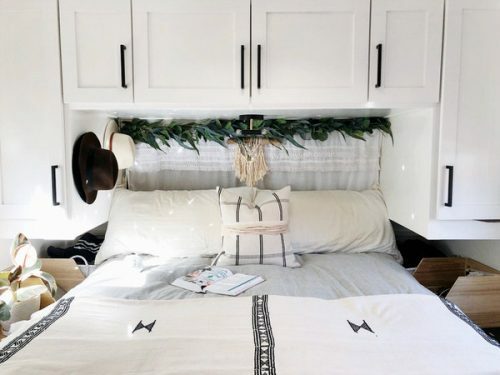 Inspiring remodeling stories are what we live for here at Mobile Home Living. 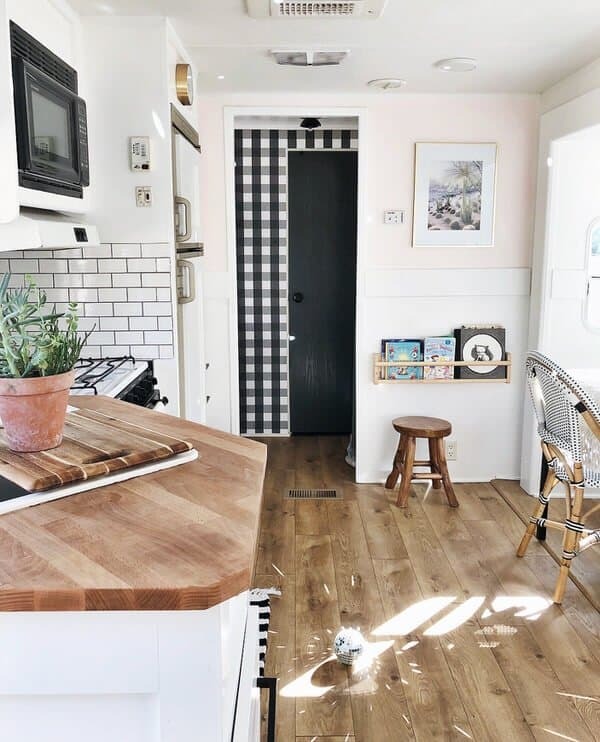 Whether it be a manufactured home that’s transformed or an RV/camper that has been given new life we just can’t seem to get enough. 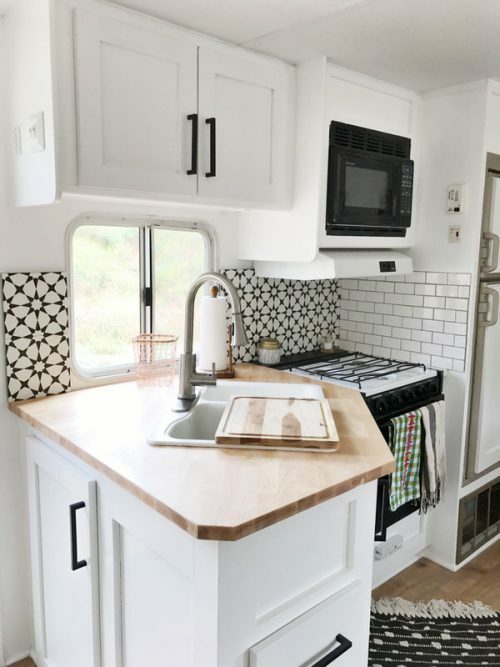 That’s why when we saw this affordable RV renovation from Ashley in California we knew we wanted to see more. Related: Another great camper remodel we have featured on Mobile Home Living. 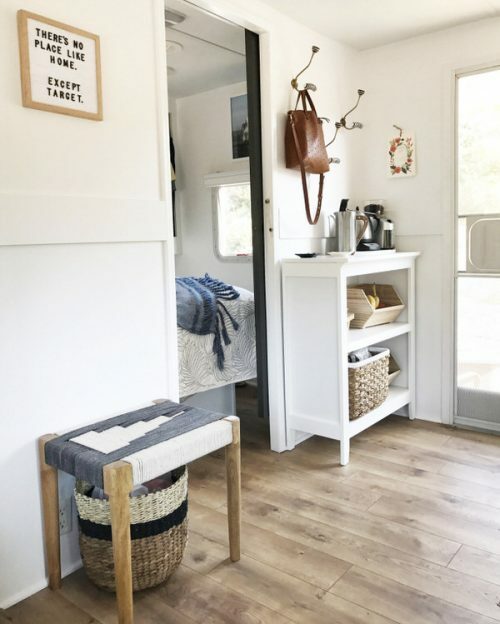 We first saw this affordable RV renovation on Apartment Therapy. Which is a wonderful site that features small homes. It turns out the family also has a great little blog Arrows and Bow in which Ashley chronicles their adventures of living in an RV. 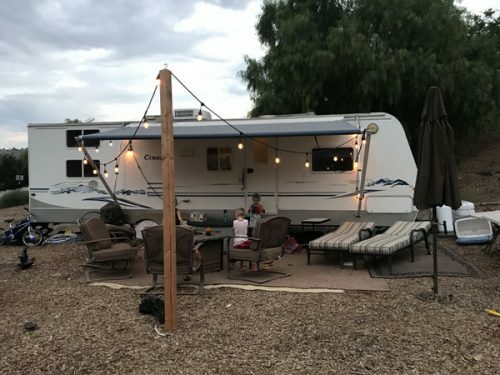 So what would motivate a couple with three small children to want to leave their five-bedroom home and move into an older RV? It turns out they had been on the hunt for a new home for awhile now and weren’t able to find the home of their dreams. So, they decided to build their own. 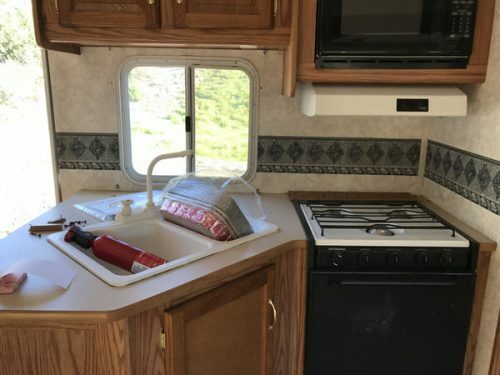 They purchased a little over 2 acres of land and instead of living in an apartment while building their new home, they invested in an older 31-foot Cougar Keystone RV and did a quick three week affordable RV renovation for less than $3000. Most recently, painting the exterior. The exterior before the new paint job. Crisp and clean describe the exterior now. To begin the renovation process, everything that needed to go was stripped out. 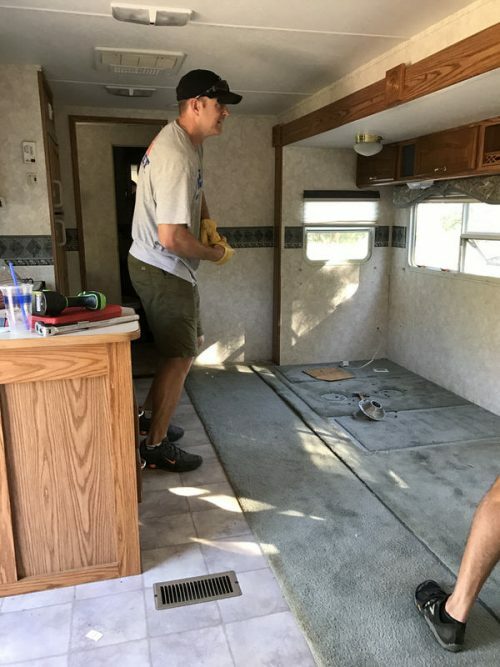 This included furniture, wallpaper (which is always a chore to remove) and of course the carpet that many older RV’s have. Next up was to locate contractors to do the work that the couple couldn’t complete on their own. We have talked in the past about how important it is to do your homework when finding a contractor, and Ashley and her husband were able to find guys who were able to come in and do the work in record time. We especially love the new flooring! This RV doesn’t feel crowded at all. 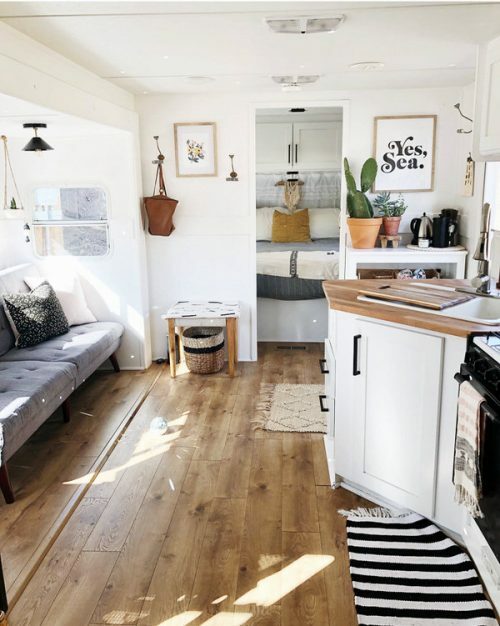 According to Ashley, the RV features a combination of all the styles that she loves. The main thought for the RV was to make it light and have the same theme throughout. And of course to give them ample space for their family of 5. With that in mind, white with black accent became the recurring look. Ashley says that one of her favorite features of the renovation is the designer tile she used for both the kitchen backsplash and the bathroom. The black and white tile accents the space well. The RV features a bedroom for the couple and three bunk beds for the kids. There is also plenty of space, so the family has room to move. Boring and brown describe these cabinets. A fresh coat of paint and new hardware change the feel of the whole room. Look how that backsplash accents the white walls. One of the most notable things we took from Ashley’s post? The process of deciding what they needed in their temporary home and what they could live without. Every item that is in the RV was brought in piece by piece, and if there wasn’t a space for it, out it went. We could all probably take lessons on learning a more minimalistic approach to our homes! Every piece in the RV has a purpose. 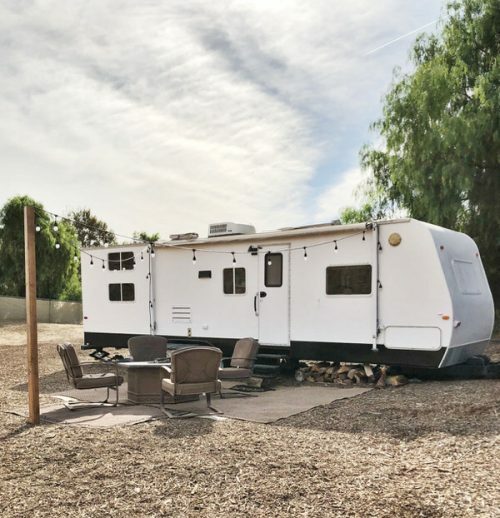 Not only has this affordable RV renovation made a great temporary home for Ashley and her family, but according to the site it has also created a new business opportunity. The couple is now taking on the task of renovating trailers and airstreams for others. We would agree that they have a knack for restoring and decorating! 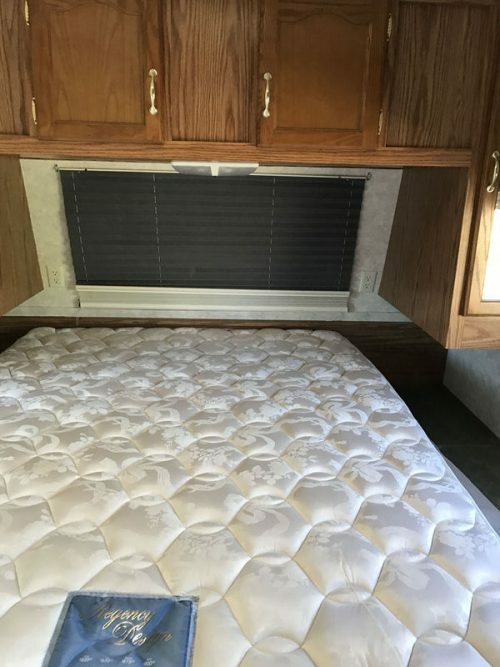 We hope you have enjoyed this beautiful and affordable RV renovation.